Gluten-Free intrigues me, and I couldn’t help but try making my own version of these. I thought that substituting some brown sugar in place of white sugar would help with some “stickiness”, but I still feel these could have held together better. 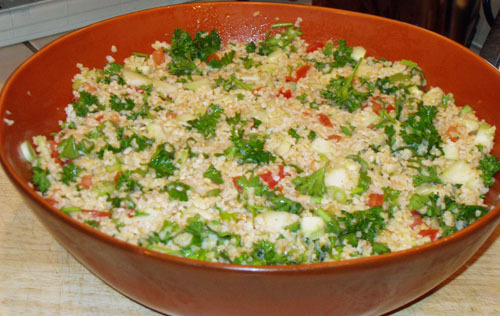 The key might be xanthan gum or guar gum; if you’ve got either, try adding a teaspoon. Preheat oven to 350. 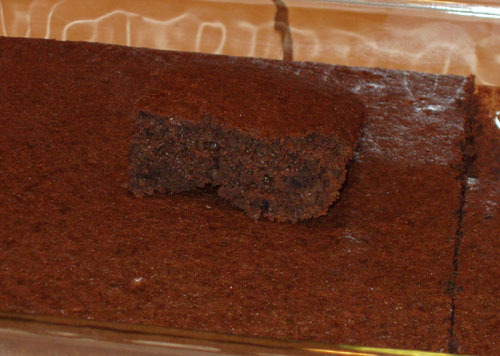 Lightly grease your brownie pan, and set aside. In a food processor or blender, combine beans and melted chocolate until it forms a smooth paste. You can add the rest of the ingredients and blend well, or you can transfer the beany chocolate to a large bowl and mix everything in the large bowl. 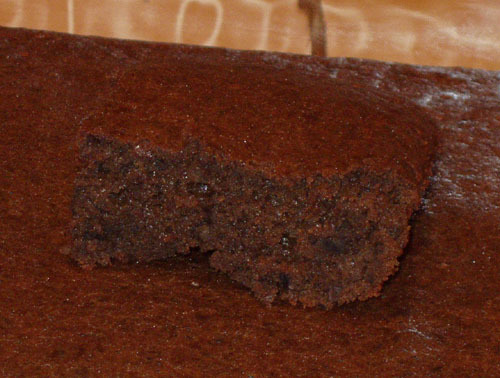 Transfer to an 8×8 brownie pan (or 7 x 11 glass pan), and bake for 30-35 minutes or until a toothpick comes out clean. Today, I am using a packet of Starbucks Decaf Italian Roast VIA, which measured 1.5 tsp. I shouldn’t have put the whole packet in, as you can definitely taste the coffee. Maybe espresso powder or just cutting down to 1 tsp would make a better flavor. I don’t mind tasting the coffee, though. <3 coffee. Overall, these were delicious and awesome. If I bake brownies from scratch again, I’ll be using this recipe. I might add some flour or guar gum to bind the brownie together better (it’s kind of crumbly), but I wouldn’t change anything else. Day 2: They’ve been in a covered pan all night, and the top is now “sweaty” and they seem to be pretty dry. You can definitely tell it’s beans today. Very interesting. Day 6: Don’t keep these for this many days. They developed a stench, and I had to throw them out. Olives, piyaz, hummus, pita bread, cucumber raita, and tabouli. Total time: Approximately 5 hours. The 2010 February Daring Cooks Challenge was hosted by Michele of Veggie Num Nums. Michele chose to challenge everyone to present a mezze table. 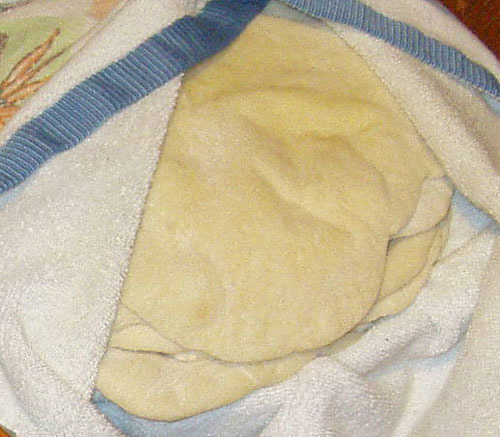 The required recipes were pita bread (here) and hummus. 1. 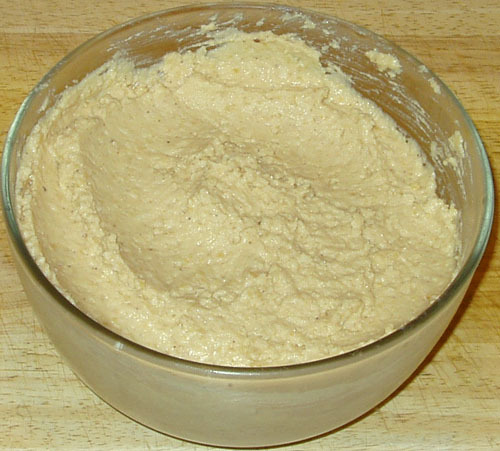 In a large bread bowl, sprinkle the yeast over the warm water. Stir to dissolve. Stir in 3 cups flour, a cup at a time, and then stir 100 times, in the same direction to activate the gluten. Let this sponge rest for 90 minutes. 2. Sprinkle the salt over the sponge and stir in the olive oil. Mix well. Add more flour, a cup at a time, until the dough is too stiff to stir. Let the dough rest 10-15 minutes. 3. 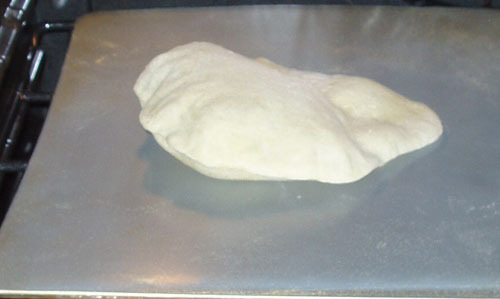 Turn it out onto a lightly floured surface and knead for 8 to 10 minutes, until smooth and elastic. Rinse out the bowl, dry, and lightly oil. Return the dough to the bowl and cover with plastic wrap. Let rise until at least doubled in size, approximately 90 minutes. 4. Place a pizza stone, or two small baking sheets, on the bottom rack of your oven, leaving a 1-inch gap all around between the stone or sheets and the oven walls to allow heat to circulate. Preheat the oven to 450F (230C). 5. Lightly flour the top of the dough and both sides of your hands. Gently punch down the dough. Divide the dough in half, and then set half aside, covered, while you work with the rest. Divide into 8 equal pieces and flatten each piece with lightly floured hands. Roll out each piece to a circle 8 to 9 inches in diameter and less than 1/4 inch thick. Keep the rolled-out breads covered until ready to bake, but do not stack. 6. Place 2 breads, or more if your oven is large enough, on the stone or baking sheets, and bake for 4 to 6 minutes, or until each bread has gone into a full balloon. If for some reason your bread doesn’t puff up, don’t worry. Wrap the baked breads together in a large kitchen towel to keep them warm and soft while you bake the remaining rolled-out breads. Then repeat with the rest of the dough. 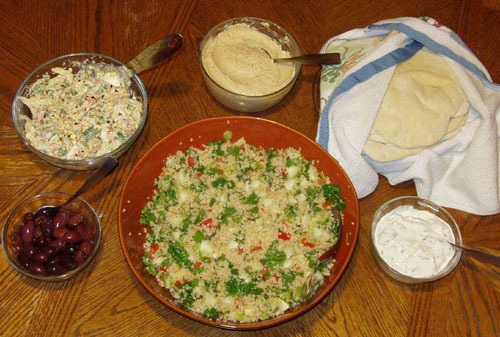 Shown here with kalamata olives, Almost Turkish Piyaz, hummus, cucumber raita, and tabouli. I normally like to edit the Daring Cooks recipes to make them more understandable outside the DK, but in this instance, I thought I’d keep all of the extra notations in the ingredients. Really, if you’re using dried garbanzo beans, your directions are different than if you’re using canned beans. And sometimes your canned beans are too firm and need to be boiled anyway. It’s something you’ll just have to decide each time you try to make hummus. If you’re lucky like me, you have a pressure cooker that does all the work for you, in 30 minutes or less. 4. Mix in the cumin, garlic and coriander leaves. 5. Stir in the cucumber and sprinkle with cayenne. Chill before serving. After doing the pork satay for the January DC Challenge, I thought I’d give this book another go. Adapted from Five-spice Lamb in 1000 Recipes by Martha Day. Brown beef in a large skillet. Remove with a slotted spoon and set aside. Maintain the grease in the pan to saute onions, garlic and ginger root. Cook on medium-high heat until onions turn translucent or even golden. Add the meat back to the pan, as well as tomatoes, stock, hoisin, soy sauce, and five-spice. Mix well. Cook for 2-3 minutes. Salt and pepper to taste. 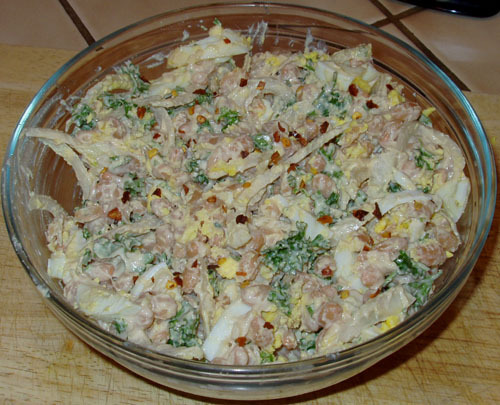 Transfer to a casserole dish and bake, covered, for 60 minutes. If you’re using the optional vegetables, bake for 45 minutes, stir in vegetables, then bake for another 15 minutes. 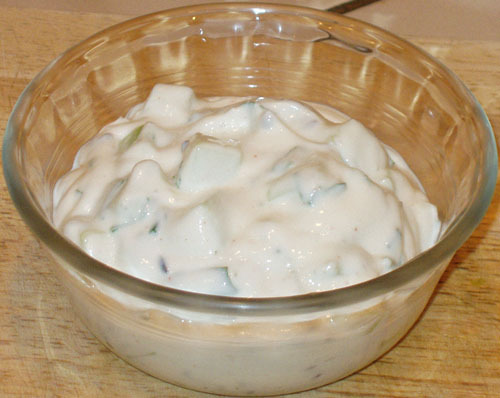 Stir in cilantro and tahini just before serving. 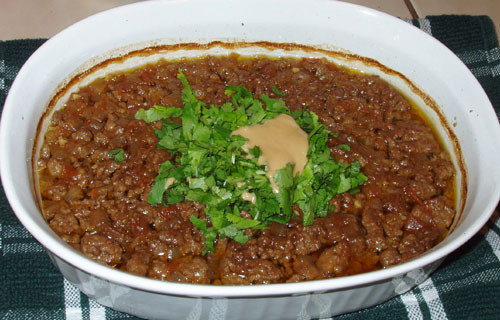 The original recipe calls for minced lamb and lamb stock, as well as toasted sesame seeds instead of tahini. I skipped the vegetables and served this (with a full 1/2 cup of cilantro) as a bolognese sauce on top of Elise’s Spanish rice. I think it would have tasted great on top of soba noodles… maybe next time.